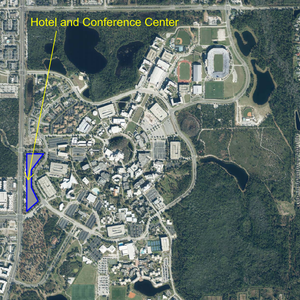 UCF announced it would present its plans on the downtown campus, but the presentation was asked to be put on hold. 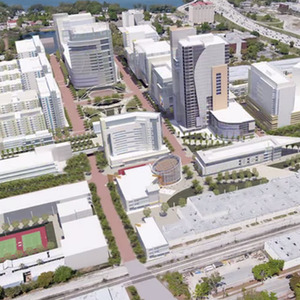 At a Board of Governors’ meeting in Miami Thursday morning, UCF announced it would present its plans on the downtown campus, but UCF's President John C. Hitt asked at the meeting for the presentation to be put on hold. Vice President for Communications and Marketing Grant J. Heston sent a written statement on the presentation to the BOG to be postponed to a future meeting to provide the most comprehensive overview possible. Orange County Commissioners committed $3 million to the campus project, said Christine Dellert, assistant vice president for strategic communications and marketing, in an email. “Valencia College’s Board of Trustees on Oct. 21 approved the downtown campus as a top priority and plans to contribute $2 million toward the construction of a new academic building that it will share with UCF,” Dellert wrote in the email. Because 10 percent of the proposed new academic building will be used by Valencia, $2 million is the amount proportional to the $20 million, out of the $60 million, UCF is asking for from the state legislature. Currently, the downtown campus plans to serve nearly 7,000 UCF and Valencia students in digital media, communication, public service and health-related programs. Dellert wrote that the downtown campus, which offers a four-year degree for about $6,000 less in tuition and fees than the state university system average, will benefit thousands of students by placing them within walking distance of internship and employment opportunities. Rachel Stuart is a News Editor for the Central Florida Future. Follow her on Twitter at @RachSage or email her at RachelS@CentralFloridaFuture.com.